People go through different steps when educating themselves on a technology that is new to them. It’s ok (and totally normal) to never have wondered what cutting power density is. Or stream lag. Or a check valve. I mean, how much do any of these things even have anything to do with waterjet cutting? The answer is a lot, but that is not the point. The point is, to feel confident in your understanding of waterjet technology and all the industry terms used to explain it. Perhaps you are already there, and that is great! But don’t worry if not, I have a solution just for you. Some pretty cool people I work with have helped put together a resource for those of us exploring waterjet for the first time, or even the most experienced looking for a quick reference. The Waterjet Dictionary is one of our newest resources and I’m happy to be sharing it with you. I think a good place to start will be to take a look at five of the definitions I think are most important when first learning about waterjet technology. “With waterjet cutting, as pressure goes up, the speed of the waterjet stream increases. Once the stream exits the orifice, it’s all about velocity. There is no pressure in the stream after the water passes through the orifice. Why does this matter? Because waterjet is a supersonic erosion process. Increasing the speed of the waterjet stream increases the speed – and efficiency at which you cut. In abrasive waterjet cutting the faster the stream, the quicker the abrasive moves, the faster the cutting, the smaller the diameter of the stream, and the less abrasive is required. These are huge benefits packed into two not-so-huge words. Why does this matter? The industry defines differences in pressure levels most commonly by the pressure ranges used for high pressure plumbing runs (these are your water delivery lines, T’s, elbows, and such). Understanding pump pressure is key when evaluating waterjet technology, as we know from stream velocity – pump pressure has a huge impact on productivity. Why does this matter? 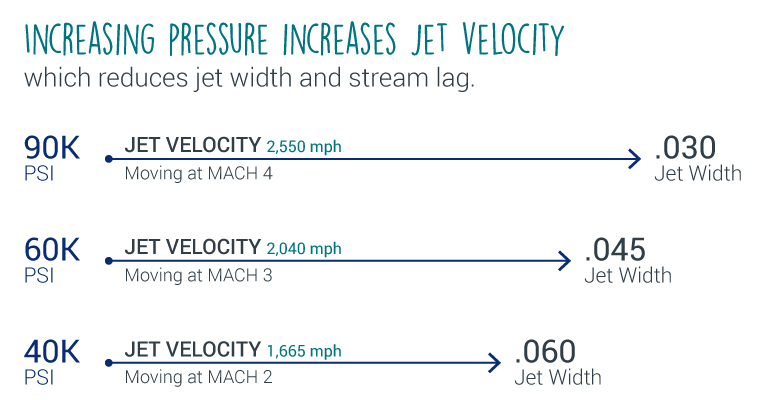 We know that pressure directly impacts our productivity with stream velocity, and higher pressures mean a faster waterjet stream. By understanding waterjet efficiency, and the relationship between pressure and power, you can feel empowered that you are choosing the most productive system possible for your shop. Why does this matter? A direct drive pump could be considered a common pressure washer on steroids. Imagine a pressure washer used to clean your driveway, or the side of your house to prep for paint: a direct drive pump is the same type of pump, only operating at up to 60,000 psi – capable of powering a waterjet cutting the hardest materials. The major limitation of direct drive pump technology is that it cannot operate at HyperPressure levels, they max out at 60,000 psi. “The linear intensifier pump is the original, and most common, technology used in waterjet cutting. Intensifier pumps use the “intensification principle” to pressurize water. Why does this matter? Intensifier pumps for waterjet cutting have evolved for decades to meet the demands of 24/7 high production environments. The intensifier pump is the most dependable pump available, typically with longer maintenance intervals. HyperPressure of 94,000 psi can be achieved with intensifier pump technology. I hope this was a valuable introduction to our newest resource–the waterjet dictionary. There are a number of factors to consider when learning about waterjet technology, and ensuring you have a common understanding of the industry terms used to describe them is helpful when comparing and evaluating a solution that is the best fit for your shop. I had no idea that there was anything beyond ultrahigh-pressure. It seems that there may be no end to the advancement of the water pumps that generate the pressure necessary for cutting just about anything. With this kind of output, I’m amazed that pumps like the linear intensifier, or any high pressure piston plunger pump, can be made to be dependable and durable. Yes, the ability to design pumps and delivery systems to withstand the pressures involved is intriguing engineering. Pump systems today are rated to 60,000 psi (direct drive three-piston pump) and 94,000 psi (linear intensifier pump). 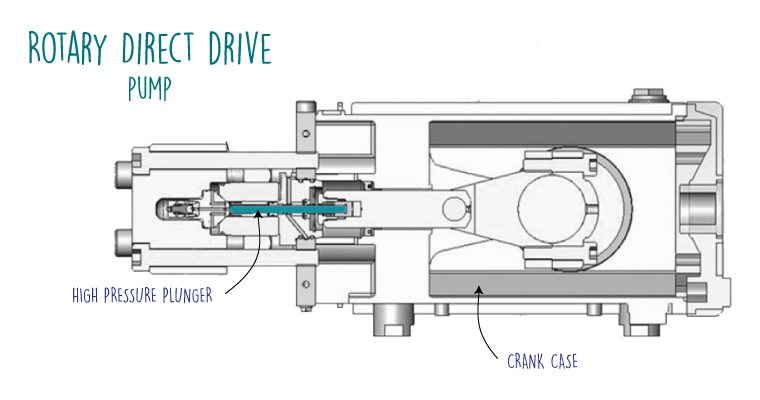 My opinion is it will be hard to get the direct drive rotary pump to significantly higher pressures than today because of the high stroke rate and potential fatigue. Linear intensifier pumps have a much higher pressure potential. Materials used, manufacturing techniques and small design features make a big difference. One key thing to always keep in mind regarding waterjet design is we’re using PSI (pounds per square inch) concepts throughout waterjet design. Force = Pressure x Area. If the pressure goes up and the area the pressure is touching goes down, the force can be managed. Luckily, as we increase pressures the amount of water we need to do the work is less (you throw less water per minute at 94,000 psi than you do at 60,000 psi for the same pump and same input power) so the internal (not external) areas of the pump that contain pressure can become smaller. In summary, as we go up in pressure we make the area the pressure touches smaller and deliver less water at higher velocity. PSI is a key foundational concept in ultrahigh-pressure waterjet and hyperpressure waterjet technology. Sharing valuable information about 5 terms of water jet and need of understanding water jet…. Great ! An impressive blog.Waterjets terms are clearly explained here.I came to know all that things.